Premium quality authentic 100% Ceylon Cinnamon Bark essential Oil. 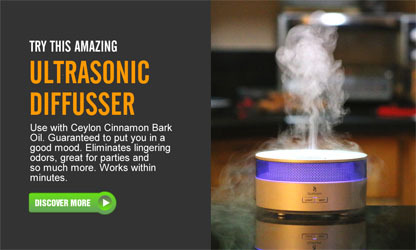 Steam distilled with a minimum of 75% Cinnamaldehyde. Perfect for aroma therapy and food flavoring. Just one drop added to a hot beverage delivers all the power of Ceylon Cinnamon with a scent that is truly mesmerizing. Often called the " Elixir of the Gods " this powerful essential oil will protect you like no other. Discover how to use it wisely, both internally or diffused externally and it will reward you. Makes a wonderful Christmas gift. Nothing says Christmas like the scent of Cinnamon. Perfect for diffusing at Christmas parties to put everyone in a good mood. Not blended or diluted with any other oils. 100% Pure. Zero artificial or natural flavors. Ceylon Cinnamon Bark Oil steam distilled from the Bark of the Cinnamon Tree. The best quality Ceylon Cinnamon Bark Oil is achieved only with the use of clean Cinnamon Bark that has been carefully selected for the steam distillation process. The higher the levels of Cinnamaldehyde, the better the quality. It is Cinnamaldehyde that gives that quintessential Cinnamon aroma and its special properties. So we have gone to extraordinary lengths the obtain the highest quality Ceylon Cinnamon Bark Oil you can get. If you have difficulty using the Euro dropper bottle watch this YouTube video. As an addtional measure first turn the bottle upside down with the cap closed, then open the cap amd turn it a quarter turn and one drop should come out. Cinnamon Bark Oil (Cinnamomum Zeylanicum/Verum) has a warm and soft exotic aroma with a light yellow color. 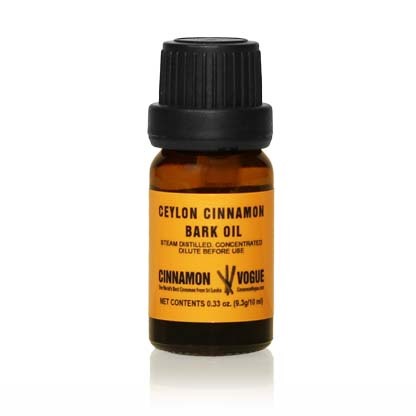 The smell of Ceylon Cinnamon Bark Oil is very refined and sophisticated, especially compared to Ceylon Cinnamon Leaf Oil. Hot and sweet taste - What makes the aroma and taste so refined is the level of Cinnamaldehyde. Ceylon Cinnamon Bark Oil is also of much better quality than Cassia Cinnamon based Cinnamon Oil and has negligible levels of Coumarin. That makes it suitable for internal consumption. Cinnamon Bark Oil is anti-bacterial, antiseptic, and anti-fungal. anthelmintic, antidiarrheal, antidote, antimicrobial, antiseptic, antispasmodic, anti putrescent, aphrodisiac, astringent, carminative, digestive, emmenagogue, hemostatic, orexigenic, parasticide, refrigerant, spasmolytic, stimulant, stomachic, vermifuge. Ceylon Cinnamon Bark essential oil (Cinnamomum verum), is relatively non-toxic; possible irritant because of the Cinnamaldehyde in the oil. Eugenol the major ingredient in Cinnamon leaf oil is also present in Cinnamon Bark Oil to lesser degree and is an irritant to the mucous membranes (i.e. lips): so use in moderation. Do not use styroform cups or paper cups if adding Bark Oil to coffee or tea as the oil will react and burn a hole in the cup. Can be a skin irritant, redden, and even burn sensitive skin so use carefully (no more than half drop per bath for example). Avoid in cosmetics and during pregnancy. 5.0 out of 5 stars Serious Cinnamon! Tastes & smells fabulously Cinnamon! I have used these products abt a year now and very happy with them. This stuff is very tasty and HOT. The FDA does not grant approval for natural essential oils but only for drugs that claims a specific cure. Which is why we cannot claim that Cinnamon cures anything. However they do have a database of essential oils under the generally accepted as safe (GRAS) category where Ceylon Cinnamon Oil is listed as safe. Click the link below to visit. CAN YOU CONSUME CINNAMON BARK OIL INTERNALLY? 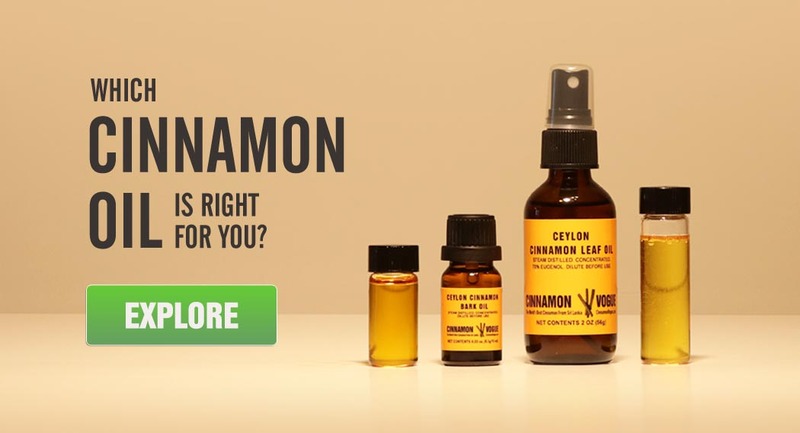 Yes you can consume both Ceylon Cinnamon Leaf Oil and Ceylon Cinnamon Bark Oil provided the quality is good. Generally speaking Cinnamon Bark oil and not Cinnamon leaf oil is used for internal consumption. This is because Cinnamon Bark Oil (as used in our black tea) is ultra distilled and softer on your stomach and contains high levels Cinnamaldehyde, an ingredient research shows is very good for you. Some people do take Ceylon Cinnamon Leaf Oil internally for specific purposes but be warned it will cause Herxing at the beginning. Also visit the National Association For Holistic Aromatherapy on how to use essential oils.